Windows XP Mode in Windows 7 lets you run older software that was designed for Windows XP. 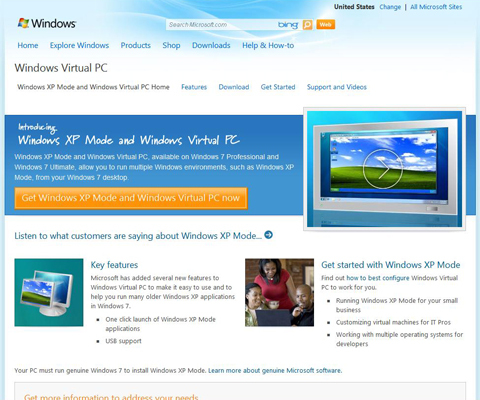 Windows XP Mode was designed specifically to run the kind of custom software that many small businesses use to maintain customer records. Once Windows XP Mode is installed on your Windows 7 computer, you can install your older software and run it seamlessly from your Windows 7 desktop. You get all the advantages of Windows 7 without losing your existing software. To install Windows XP Mode on your Windows 7 PC you must have a 1GHz processor and a CPU that supports virtualization. You must also have at least 15 GB of hard drive space and be running Windows 7 Professional or beyond. Open Internet Explorer and go to the Windows Virtual PC Web site. Click Download. Microsoft asks you to verify that your system can handle Windows XP Mode. Not sure whether your machine supports virtualization? Download Microsoft’s virtualization testing tool. Just double click the downloaded file and it will examine your PC and tell you whether it can handle Windows Virtual PC and whether your visualization technology is already enabled in your BIOS. Some new computers come with Windows XP Mode already installed. To see if you already have Windows XP Mode, type “virtual” at the Start menu and then scroll down to see if Windows XP Mode is already listed. If it is, click it and skip to Step 4. Select the version of Windows 7 you’re running and the language you want to use. Click the Windows XP Mode button (located under Step 5). If you haven’t already installed Windows Virtual PC, you’ll need to download and install that program as well. If you’re not sure which version you need, open the Start menu and right-click Computer. Select Properties and then look at the System type to see whether your system is 32-bit or 64-bit. Locate and double click the downloaded file. You might need to click Continue if prompted by User Account Control. Click Next through the pages of the installer program, allowing the program to choose the appropriate defaults. Click Yes to complete the installation and Finish to close the installer. Once the installer is finished, you can access Windows XP Mode from the Start menu. Click Start, type windows xp, and then press Enter. Microsoft shows you the licensing terms for Windows XP Mode. Click I Accept and then click Next. The wizard then asks for security information. Create a password for the default user account and select Remember Credentials. This will enable you to use Windows XP Mode without having to reenter your password each time. Select the Yes I want to share option to share your drive with Windows XP Mode and click Next. Select the automatic updates option to ensure that your system has the latest updates to Windows XP Mode. Click Next. When the installer finishes, Windows XP Mode will appear as a window on your Windows 7 desktop. You’re now ready to install your Windows XP programs.